We in the mockup stage right now. But I guess I can make this into a full game, since it ain't my first rodeo. The beginnings of my s3&k reimagined project on Sonic World fangame. I've never been a big fan of BlitzSonic-based levels, but some things that I've seen fairly recently pointed out some of the reasons why, and they're things that I think should be able to be fixed. 2: Correct me if I'm wrong, guys, but levels in stuff like Sonic Generations loads a detailed model for the visual terrain, and a much simpler model for the actual collision. Since Angel Island is a thickly-forested area, if Sonic World has support for this feature, what I would do is use your current model as the collision data, and replace a lot of the sheer flat walls with thickly-growing trees for the visual model. Just make a few basic shapes that you can copy/paste like tiles, and repeat that shape along where the walls should be. If the trees are growing thickly enough to convey a feeling to the player that they shouldn't go this way, covering those trees with an invisible wall to fill in the gaps is a perfectly reasonable thing to do. Look at Green Hill Zone in Sonic Generations. Visually, there's often nothing keeping you on the track except for a small wooden fence, but that's enough to visually tell the players where to go, and the invisible walls aren't an issue. ...There are some interesting points in the video about invisibly leading the player. Some simple N64-era lighting (just darkening textures directly for shadows, or manually drawing very transparent black textures a minute amount above the ground texture for shadows) is more than enough to shade out unimportant areas and lighten the paths and routes just enough to catch the player's eye. Another alternative is something used in top-down games like RPGs. Have a light-color grass texture like what you currently have, and darker thicker-looking grass textures as well. Use the lighter color liberally to mark the most obvious routes, and splatterings of the lighter color to hint at alternate routes. The idea is, the lighter color will indicate shorter "stamped-down" grass where people tend to go, while the darker color indicates grass that has been able to grow thicker since people and animals have no reason to step there. This will have the additional benefit of adding more overall visual appeal to your level. 4: Part of your video indicates that Sonic World features dynamic/automated camera angles, as well as grind rails. A large part of your level has wide-open areas with no point to them besides letting the player run, when there's space and opportunity to give them something to do. For instance, near the end of the level you have your interpretation of the airship bombing segment for the original Angel Island. However, while the original had the visual appeal for something as simple as "hold right", your ship is located so far above the player that they won't even see it unless they already know to look, and it looks like a large flat and boring stretch. What I would do is angle the dynamic camera so that you can zoom in on the ship and make the illusion that it's flying forward, then cut back to Sonic. I don't know if Sonic World allows quick-step sequences, but if not you can fake it with the usual three-rail setup. Place fires (or even better, fires that appear when the player gets close to simulate explosions from the bombs) on the rail, and have the player jump back and forth between rails to dodge it. It'll take up that space, give the player something to do besides look at the screen and press forward, and since it's already a reimagining of Angel Island, nobody's going to complain if Sonic's grinding tree branches or something during the bombing run instead of running along the ground. 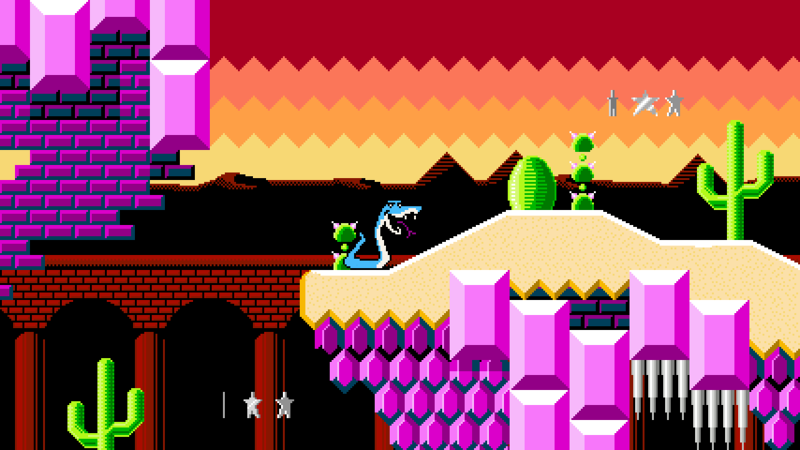 Hey Jay, that desert looks familiar- didn't you do a Sonic 1 hack with something like that, I dunno, a decade ago? It's a pretty game. Tried my best to capture the feeling of where I was heading with my old, pre-S Factor, hack Sonic One with it, without outright copying the art that made it to Aquaslash & Pals' effort, yeah. Great that it shows, but in a side-to-side comparison they're different enough. Extremely early days yet. Spiritually, this will be going where my old hack Sonic One was ideally headed, only without the trappings of being a hack of Sonic the Hedgehog and with more original content (insofar as being another fast-moving blue animal can get, heh). I have a few ideas to make this game unique, playing those cards close to my chest for now. 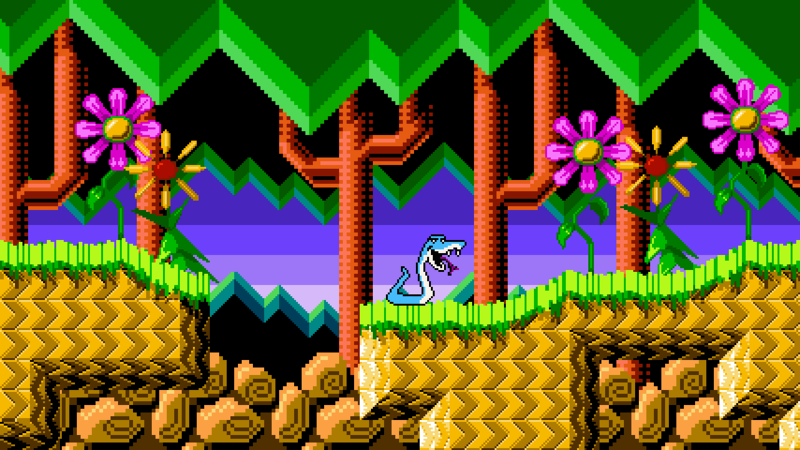 So enjoy a few layers of NES-palette parallax here. It's been a while since I showed this here. That layout looks a lot more fun than what we got with the Sonic 2 remake. Good job! EDIT: Should mention I'm not bashing the remake, it just didn't feel like a Sonic 2 zone. This did. Needs more green flashing orbs! Looks alright so far - it's definitely more Sonic 2-y in some areas than the 2013 remake, though I'm guessing you're still working on the layout. The other thing is the bottom of HPZ's background is never seen - the prototype seems to hint that it doesn't want to have the background waterfalls visible when Sonic is underwater. The waterfalls being seen under the water bugs me, too, but I think it happens in other games? I mean, it technically happens in Chemical Plant, for instance, where you actually see a lake in the distance even as you're under the pink water. Hey, that's really something! I dig this version of Hidden Palace. I think its just about time you set up your own project thread. This project is stand out and needs one ! Seconded! Create a dedicated thread for this awesome project. I'd happily contribute and I'm sure many here would do the same. Plus it'd be a great destination for updates. Lovely video also. Exceptionally good graphics that improve on the baseline Green Hill Zone in every way imaginable - like your also exceptional work on Marble Garden Zone. You have some mad skills. Start a dedicated thread!